In early September of 1937 a total of 170,000 ethnic Koreans were forcibly taken to trains, which took them thousands of miles to various Central Asian countries including Uzbekistan and Kazakhstan. They were living in the border area between ex-Soviet Union and Korean Peninsula. They settled there after fleeing the harsh colonial yokes of Imperial Japan, which ruled the Korean Peninsula from 1910 to 1945. 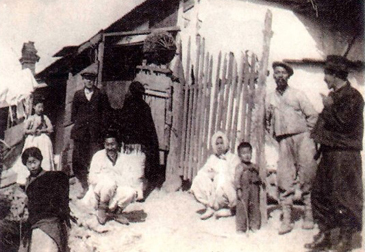 The massive resettlements of ethnic Koreans to the former CIS countries were made on the order of the Soviet dictator Joseph Stalin, who feared and suspected that many of the Koreans were operating as spies for Japan, which conquered Manchuria and much parts of China proper. But, in actuality, the ethnic Koreans were the supporters of the Korean independence fighters against Japan. Overnight they were put on the cargo container trains and taken to many nations of the Central Asia over a period of three months for new settlements in the far-flung wildernesses. Many of them died in the process. Still some 185,000 ethnic Koreans live in Uzbekistan and up to 100,000 reside in Kazakhstan. A little over 100,000 Koreans are still in Russia. In total some half a million ethnic Koreans live in former CIS countries including Russia and Uzbekistan. They are called "Koreitsi" in Russian, meaning Goryeoin (高麗人) or people of Goryo (高麗), ancient name of Korea. Highly diligent and industrious, Goryeoins excelled as farmers, turning wilderness into fertile lands. In Uzbekistan on the hard toils of their parents three Goryeoins became congressman since 2014, while most are well-off residents there. One of the Uzbek Goryeoins is Ms. Tsay Lyubov, team manager of International Contractors Association of Korea (ICAK) based in Seoul. She is a market researcher for local Korean construction firms advancing Russian-speaking countries in Central Asia. She came to Korea from Tashkent a decade or so ago for her advanced study at Seoul National University initially. She earned her master's degree in Korean language and literature from the prestigious university on a South Korean government scholarship. Prior to her arrival in Seoul she already graduated from Tashkent State Institute of Oriental Studies, majoring Korean language and culture in 1999. The institute is noted for producing top bureaucrats and politicians in Uzbekistan. "I was not able to speak Korean back then," said Tsay in a recent brief interview. "That is why I decided to study the language of my ancestors at college"
Her efforts to trace back her identities and heritages led her to South Korea. "I think I was lucky because I was able to get graduate education at Seoul National University and I was able to land a job in Seoul," she said. "I got this ICAK job eight years back," she said. "I wanted help Korean businesses with my Russian language and with my expertise in the local Central Asian nations"
A multi-lingual and multi-cultural Tsay speaks fluent Russian, English, and Korean. Currently, a number of global Korean construction giants are advancing into the Russian-speaking countries including Russia, Central Asia, and Eastern Europe. They include Hyundai Construction, Hyundai Engineering, Lotte Construction, POSCO Construction, Samsung Engineering, KCC, GS Construction, and Daelim. Fergana Horses — Fergana Valley in modern-day Uzbekistan is famous for producing Fergana horses. They were called "Celestial (Heavenly) Horses" by emperors of ancient China who so coveted them that they triggered a war to get them. Chinese also called them Dayuanma (大宛馬), meaning horses of Dayuan (大宛) Kingdom, Chinese name for Fergana. Chinese records call them "Sweats Blood Horse (汗血馬), meaning blood sweating horses. Now, the Fergana horses are commonly known as Akhal-Tekes of Trukmenistan, parts of Fergana Kingdom in the past. "I am really proud of myself because I could be some help for these Korean companies in their business" Tsay said. "There are many Goryeoins like who want to come to Seoul for study or work"
In January of 2016 Tsay received an award from the Minister of South Korean's Land, Infrastructure, and Transport Ministry for her and service and dedication in the area. Tsay enjoys all kinds of Korean food as other Koreans in Seoul. She also rubs her shoulders her coworkers and local friends over dinners. Tsay said that she often visit Uzbek restaurants in Dongdaemun area in Seoul whenever she misses her Uzbek food. Born in 1978 in Fergana Valley in eastern Uzbekistan She moved to Tashkent at the age of three. She and her younger sister grew up in the Uzbek capital, attending schools all the way up to university. Her sister Ms. Tsay Alexandra now works as a school teacher in Tashkent. "Fight against Corruption Is Actual Task"